It is generally considered that the Austrians, Japanese, Germans and French currently lead the way in terms of competition climbing. That said, British climbers are climbing their way up the podium places. 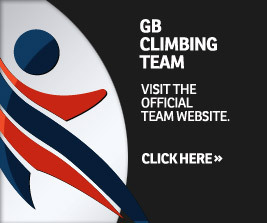 The GB Climbing Team is made up of the Senior Team, the Junior Team, the Ice Climbing Team, the Ski Mountaineering team and paraclimbing team. The GB Paraclimbing Team had a fantastic international season in 2018. More information on this achievement can be found here. Competitive ice climbing comes under the banner of the UIAA (International Climbing and Mountaineering Federation). Ice climbing has an exciting future and was part of the cultural programme at the Winter Olympics in Sochi, Russia 2014 with a view to be included in the 2022 Beijing Olympic Games. The International Federation of Sport Climbing (IFSC) runs international competitions in the disciplines of lead, speed and bouldering. The GB Climbing Team currently competes internationally in lead and bouldering and occasionally in speed climbing (but we don't have an official speed team currently). The IFSC World Cup series takes place annually and the IFSC World Championships take place every two years. In 2016, there is live streaming of the semi-finals and finals of all senior IFSC World Cup events. TV quality highlights are available for media use shortly after each event. In 2013, the BMC supported the IFSC’s bid for Sport Climbing to be part of the 2020 Olympics. Sport Climbing was on a shortlist of eight sports being considered for possible inclusion in the 2020 Olympics.This bid was sucessful and Sport Climbing will make its debut at the 2020 Olympic Games in Tokyo. Only the top 20 male and top 20 female athletes will qualify to attend the games. 1) World Climbing Championships in Augusdt 2019 in Tokyo. The top 7 climbers will qualify for the Olympic Games. 2) Special Olympic Qualifying event in Toulouse in November. This is an invitation only event and the top 6 athletes will qualify for the Olympic Games. 3) Continential Championships in Moscow in 2020- only the athelte who finishes in first place will qualify for the Olympic Games. Meanwhile the UIAA (International Climbing and Mountaineering Federation) is preparing to launch a bid for the 2022 Winter Olympics once the IOC criteria for adding new winter sports is finalised. This follows it's inclusion in the cultural programme at the Winter Olympics in Sochi, Russia 2014.